Hibiscus Liqueur and Lapsong Souchong Tea Syrup… are you f****** kidding me? Am I the only person more than a little surprised by the recent Whisky Advocate article on summer cocktails? I was really excited about finding new ways to drink whisky during the incredibly long and hot summers we "enjoy" in Texas because I was seriously considering taking my summer drinking business back to simple, cold beer. Dave Broom did contribute a very nice piece on ice, water and soda with whisky and I will certainly try some of his recommendations, but the piece I was really anticipating on whisky summer cocktails was frustrating to put it mildly. I am guessing the average whisky enthusiast has a well-stocked bar and could rustle up most common cocktail ingredients and even find a bottle of Angostura bitters in the back of cupboard somewhere. However there was not one cocktail in the nine recipes offered I could make that did not require a visit to a specialty store to acquire a spirit, liqueur or mixer so obscure that when typed into Google would simply generate "?" as a reply. In addition all the recipes required me to formulate some syrup or other "pre-drink" concoction (Rosemary-chamomile syrup or fresh peach juice anyone?) before I could even begin to assemble the actual cocktail. My whisky budget is strained to beyond its intended breaking point and I can't be alone in refusing to buy a bottle of hibiscus liqueur even if I could find it in Texas , which I doubt, and if I did I would probably become the target of an state government observation program. 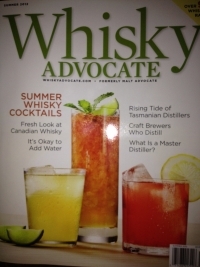 The subscribers and readers of Whisky Advocate are, I suspect, like me. They are whisky drinkers not mixologists and I am guessing the numbers of actual subscribers who have actually made one of recipes in the magazine would be far less than 1% on a good day. Was that really your intent? On day 2 of my Kentucky Bourbon Trail I made it to 4 more working distilleries, Woodford Reserve, Four Roses, Wild Turkey and Buffalo Trace and on day 3, just before I left, I visited a closed one; Sitizel-Weller. Favorites were Woodford Reserve and Four Roses (neither had a bottling hall) but the obligatory chocolate bourbon balls still made frequent apprearances. I have finally got round to writing up Day 1 of my trip to Kentucky and have posted links to the distllery reviews. I managed to make it to four distilleries on the first day, Jim Beam, Maker's Mark, Heaven Hill and Barton 1792 and I also got see the world largest whiskey barrel (which is the picture on this blog entry). Best overall experience was probably Maker's Mark but Barton was "interesting" and generally there were lots of chocolates and bottling halls. I am leaving on a short trip to Kentucky while enjoying a short break from work (and my blog) and planning the next stage of my whisky adventures including starting to host tastings in Houston and adding a Whisky History Timeline to this webpage. However I thought I would post some links to some of what I think are my better efforts of last year or so until I get back with lots of new whiskey and distillery reviews. What's the Color of Whisky? Whisky Tasting Grades: Are You A Black Belt? While single malts are the clear leader of the pack when it comes to scotch whisky enthusiasts preference, there are also some, albeit often a minority, including myself who advocate blended scotch whiskies. However one style of whisky I see very few people championing (with notable exception of Compass Box) is blended malt whisky. Blended malts are the products derived from the vatting or mixing of multiple single malts but without use the grain whiskies found in blended scotch. Usually without an age statement and often under some of the more creative whisky names out there, examples of the genre include Monkey Shoulder, Sheep Dip and Blue Hanger. Some of the high profile blended whisky producers such as Famous Grouse and Johnnie Walker have also included blended malts in their range such as the soon to be defunct Johnnie Walker Green Label. The Green Label is my inspiration for this blog, specifically the recent announcement that Johnnie Walker will no longer be producing Green Label. Johnnie Walker are astute business people, they clearly have sound business reasons for this decision. I don't know for sure but presumably they must feel that either sales of Johnnie Walker Green are not high enough, in part I suspect because of the market bias for single malts, or perhaps that they can use the malts in the Green Label product in the other products and lines and generate better returns for their shareholders. Either way it shame because I happen to think Green Label is one of the better products in their range. So what does this decision mean for the future of blended malts? Will the continuing expansion of the market for single malts drive other blended malts into the whisky oblivion alongside the other industry red headed step child grain whisky? I have to say however even grain is getting some support amongst whisky circles, an example being recent interview on www.thewhiskywire.com with Kirsteen Campbell who described grain whisky as the "as the next big thing". It is a bit worrying for blended malt fans when you hear Nick Morgan of Diageo, Johnnie Walker's parent company, recently describe Green Label as "the odd man out within the line." As I look at all my reviews of blended malts to date, they all score very well and are often very good value as blending allows producers to use less aged and therefore cheaper stocks, compensating for any weakness in those products by use of carefully selected stocks of more mature stock. When done well, as in Monkey Shoulder, it produces a rich and complex dram at a very reasonable price point. In the case of a more exclusive dram like Blue Hanger from Berry Brothers and Rudd (their iconic London store is the picture accompanying this entry) it is a fine example of the blenders skill, creating a complex amalgam but yet it is often still possible identify a particular distillery's influence on the blend. They can be best of both worlds of single malt and blended whisky, with complexity, consistency, richness, variety and value. Although in the past consumer pressure has altered the behavior of major producers, I suspect nothing I write about here will change the fate of Green Label (although I did propose a campaign slogan in my recent review of the Green Label ... Kill Black Keep Green), as it is not the fate of that product that I am passionate about (I do have an unopened bottle in my collection I will keep) but the fate of blended malts in general. I really like this genre, and I will continue to support this genre and would encourage anyone (producer, retailer, imbiber) who reads this to do the same. I know my interest in blends is shared as I recently received a sample from a friend of mine he described as "something I blended in my own cask. It is cask strength. It is scotch and bourbon blend with some grain spirit in it". Look for a review of a whisky I am calling "C" shortly. So Easter weekend I had my first opportunity to visit my "local" whiskey distilery. In fact this visit had a lot of firsts for me. It was my first bourbon distillery, my first US distillery and the first distillery where we were greeted by the founder and owner of the distillery, in this case Dan Garrison of Garrison Brothers. Pretty cool. Located in Hye, this is Texas' first legal bourbon distillery since prohibition and is producing a very nice product. They charge $10 for a tour but as this is one of the most interactive distillery tours I have ever been on and as they patiently waited for their whiskey to mature (resisting the temptation to sell white dog spirit or put an immature product on the market) I didn't mind paying. My favorite aspect of this tour was the fact we were able to try and taste at every stage of production. We could taste the mash after the corn, wheat and malted barley had been cooked (it was bit like sweet breakfast oatmeal), then taste the distillers beer during fermentation (quite sour but with some fruit), white dog spirit off the still at 140 proof (hot and herbal) and finally (of course) the matured, Texas straight bourbon. What are the main differences between a single malt and bourbon distillery? The first was the grain recipe. Garrison Brothers use corn, wheat and malted barley (but no rye which is often found in bourbon recipes) while single malt distilleries of Scotland use only malted barley. In Scotland the sugars are extracted by adding hot water to the grains, in bourbon making the process involves actually cooking the grains in water to extract the sugars. The fermentation process in most malt distilleries produces a "beer" of around 8% ABV, Garrison Brothers beer was closer to 16% ABV. Finally the distillation of the bourbon was done in a single still whereas single malt is always double distilled and sometimes triple distilled. Garrison uses 500 gal of beer at 15% ABV which is put into the steam heated stills and in turn produces about 150 gal of 140 proof (or 70% ABV) white dog spirit that is aged for at least 2 years in oak casks so that it can be called "straight" bourbon. Garrison Brothers use a #4 char, also known as alligator char (and the "alligator" in the Ardbeg Alligator). They have no license to sell liquor so we couldn't actually buy a bottle at the distillery so I bought a T shirt instead, but there is a licensed store when you turn off the main road for Garrison Bros. I believe if you are whiskey loving Texan you will love this place and being in the middle of Texas wine country (yes that really exists) there are plenty of other reasons to make the trip and visit the area as well. If I had to complain it would be the price per bottle. At almost $80 / bottle retail this is very expensive for a bourbon, but there are good reasons for that. In it's defence it is not bad when compared to the price of many Scotch single malts in Texas and hopefully with some sustained success, time (and of course increased volumes) we will see the price point reduce. I am all about value in relation to whisky. I worry about expensive whiskies "not being worth it" and I probably worry even more about low cost whiskies not getting the respect they deserve simply because they commit the sin of being either ubiquitous or cheap. My career has taught me the value of value. It's valuable. So on a whim, I decided to write down what I could buy in Specs (my local liquor store / off license) for under $20, under $40 and under $100. It was an interesting experiment, and I accept just a random sample, but still quite telling. I chose only whiskies that I knew and ideally had already reviewed. Under $20 included Ballantines Finest, Forty Creek Barrel Select, Ridgemont Reserve 1792, Buffalo Trace, Grants Family Reserve, Cutty Sark and Tullamore Dew. Makers Mark just missed out at $22. An interesting selection and a couple of things stand out. Firstly not one scotch single malt. The closest was Glen Moray at $29. However there is nothing wrong with the Grants or Ballantines blended scotch, both of which I rated as 3 stars and they were both significantly cheaper than the much vaunted (and in my opinion even more over rated) Johnnie Walker Black at $29. Ireland was only represented by Tullamore Dew, both Bushmills and Jameson were priced out of this category (just). The clear winner is (to me anyway) the Canadian Forty Creek Barrel Select which I love and have gushed about enough already. Strong representation by USA as well in this category, I am not so wild about Buffalo Trace bourbon, but I know others like it, and I recently tried the Ridgemont Reserve 1792 and I was impressed. That is a great bourbon for under $20. Under $40 was where we started to see some scotch single malts. Glen Moray as I have previously mentioned, Glenmorangie, Glenrothes Select Reserve, AnCnoc and Dalmore 12 year olds and even Compass Box Peat Monster which was on offer for $38. Perhaps the best Irish blend on offer was Black Bush at $35. Some more US whiskies were also available, the very good Rowans' Creek, as well as Makers Mark, Knob Creek (at just $26) and Baker's 7 year old. My beloved Ardbeg did not quite make it at $45 for the 10 year old. There is some good value to be had at this price range; I would have picked either the Glenrothes Select Reserve or the Dalmore 12 year for scotch, Knob Creek or Makers' Mark for bourbon and the Black Bush for Irish. Between $40 and $100 was where the single malts (at least the ones under 20 years old) can be found. Ardbeg 10 as I mentioned before is at one end of scale $45, Tobermory 15 year old was at the other at $96. In between, amongst many others, was Oban 14, Bunnahabhain 18, Balvenie Single Barrel 15, and Lagavulin 16. Very little North American whiskey is marketed (or at least on the shelf of this store) in this price bracket. The only whisky I found over 18 years old was the Aberfeldy 21 for a very reasonable $60. Best value here... for my palate I am going to say the Ardbeg 10 and Aberfeldy 21, however I have to say I like all of these whiskies and it would be hard to go "wrong". So perhaps that is the real difference between buying $20 and $100 whisky. At $20 end of the scale you have to know what you are doing in this price range or you might end up very disappointed. At the $100 bottle where the chances are you won't go too far wrong in terms of an enjoyable dram but then the question becomes are you getting value? Sports fans in the United States are currently enjoying the phenomena known as March Madness (http://en.wikipedia.org/wiki/NCAA_Men%27s_Division_I_Basketball_Championship ). This is the 68 best college basketball teams competing in a tournament, mostly held during the month of March, to be one of the four teams who compete in the final weekend (or the Final Four as it is known) for the National Championship. I also have my own final four, the four whiskies I have to yet to track down either a dram in a bar or a bottle somewhere in my search for all “101 Whiskies To Try Before You Die” (http://www.somanywhiskies.com/101-whiskies-to-try-before-you-die) . While I am yet to post all 97 reviews, I have posted 85, I have a few more I have found (or even bought but I am yet to develop notes for) and I do have a plan to acquire or taste the others soon, but these final four elude me. So I have decided to put out a request for help. Any ideas where I can acquire a dram or bottle of these whiskies (in person or online) would be appreciated and if you have a bottle perhaps an exchange of samples or a small donation in kind could be made? If you have any contacts or know of any other whisky fanatic please feel free to pass this request on. It is St Patrick's Day weekend so an Irish blog entry is required and it turns out that I have quite a lot of Irish ancestry. I knew my mother's family, Bradley, came to England from Cork in the early 20th century. What I didn't know until I did some family research in 2011 was that my father's family also came from Ireland. The Seaton's (originally spelled Seton) moved from Aberdeenshire, Scotland to County Tyrone, Ireland in the late 1600's and my great great grandfather James came over to Staffordshire in England in the late 1840's, added the "a" to Seton and we became Seaton. That connection got me thinking about Irish whiskey and the run of bad luck that nearly wiped out the Irish distilling industry. I think it can be summed up in six different events in relatively short time period, approximately 100 years that hurt the Irish whiskey industry and more often than not benefited the Scots, and changed the industry forever. Number one was the invention of the Coffey continuous still in 1832 and the ability to make the lower cost grain whiskies. Up until then both Scotland and Ireland made whisky in pot stills. The Irish clung to the tradition of pot still distilled whiskey and disputed if the product of the continuous still was even whiskey. The Scots embraced the Coffey still (though not while it was running – ouch) and eventually won the argument "what is whisky?" The irony is that this critical component in the eventual downfall of the Irish industry, the Coffey still, was in fact invented by an Irishman. The 1850s saw invention of blending of whisky, commonly credited to Andrew Usher, a Scot, who began mixing the pot still single malts and continuous still grain whiskies to produce a lighter, consistent and more accessible spirit. When the Phylloxora beetle affected French vines and wine and brandy production reduced significantly in the late 1880's it created a new market for whisky that the new lower cost, consistent and more approachable Scottish blends subsequently exploited and filled. Without Scottish blends perhaps the Irish pot still whiskies would have filled that void and been the replacement for brandy? Number three was the introduction of prohibition in the USA in 1920. The USA was huge natural market for Irish whiskey with so many Irish people transplanted to the new world after the hardships of the 1700 and 1800s and Irish was the most common imported whisky in the USA before prohibition. It is also important to note, and often forgotten, that the Temperence movement that led to prohibition in the USA was also strong in the UK and Ireland which in turn also reduced demand in those home markets and led to legislation including limiting the sales of alcohol, increasing costs of production and restricting pub opening hours. The Irish whiskies had more to lose than the Scots from the Temperance movement in the 1920s, and if Prohibition had not happened then I think it is likely Irish would have remained the imported whiskey of choice in the USA. Number four was the winning of Irish independence in 1922. The problem was this victory came with a loss of access to British Empire markets post independence, again a gap the Scots were well positioned to fill. As the debate around Scottish independence and the value of a United Kingdom is again in the news, this raises the question if Scotland had been independent and had no access to English, Empire and Commonwealth markets would the thriving Scotch industry be the same today or would we have had an English or Welsh whisky industry fill this demand or would the Irish, competing on a level footing, been more successful? Was being part of the UK the best thing that could have happened for the Scotch whisky industry? Number five was the great depression that began in 1929. After all the restrictions on sales due to temperance, the loss of access to British and Commonwealth markets the last thing the Irish whiskey industry needed was a global depression to further depress sales. Unfortunately that is exactly what happened. The final blow, number six, was the outbreak of World War II in 1939. Wartime is very disruptive to trade when you are an island and have to ship your merchandise over U-boat and mine infested oceans. In addition, prior to the invasion of Europe in 1944, many of the US troops were based in the UK (Ireland chose to remain neutral) and the whisky of choice in the UK, for all the reasons above, was Scotch. So the returning GI's at the end of the war had acquired a taste for Scotch further solidifying the US market in favor of the Scots. So much for the luck of the Irish when it comes to whiskey. It is a tremendous achievement and testament to the product that it even still exists, and I for one am really glad it does, maybe that's in part due to my Irish genes. Prior to tasting a whisky, I used to avoid reading other people’s tasting notes because I find the power of suggestion can be very strong. I do often read other tasting notes after I write my notes just for fun or to help me calibrate my own notes and sometimes to help me identify a taste or aroma that I couldn’t quite nail down, and that someone smarter than me might have been able to. When I first read Ian Buxton’s tasting notes for Deanston 12 year old in the book 101 Whiskies to Try Before You Die I was intrigued by the gingerbread reference he made and for some reason it stuck with me. When I did finally taste it (many months later) the only way I could describe the malty nose and spicy yet sweet taste of that malt was of course.... gingerbread. So was it the power of suggestion at work or does Deanston taste so much like gingerbread that I would have come up with independently? The answer I think is probably a bit of both. The taste profile certainly does contain all those elements I associate with gingerbread, but so do many other single malts and without that reference in my head I may have chosen another analogy, say cinnamon toasted breakfast cereal or a ginger snap cookie for example. Actually a sweet tea dunked ginger snap is a pretty good descriptor for Deanston 12 year old, I think I will add that to my review. I now find, as I taste more whiskies, it is becoming harder and harder not to have at least some expectations about any given dram. Even if I have not read a tasting note I now have preconceptions and ideas of what I expect to find in say a bourbon, a Balvenie or Glenlivet expression or any sherry cask matured whisky based on my experience to date. Blind tasting is perhaps the only way to avoid these types of mental connections, but to date my relatively little experience with blind tasting has been best described as a “mind f***”. Seriously, if you think you know anything about whisky, get someone to set up a blind tasting for you and then be prepared to be humbled (especially if the person is a little crafty and knows their whisky). So at the end the day if I find joy in the simple pleasure joy of recognizing the same things that others before me found in a dram, even if that is due in part to the power of suggestion rather than my sophisticated palate, then I have decided I am fine with that. After all I am doing this for fun not for science and it seems to me that whisky is all about bonding with people and sharing experiences. If the power of suggestion actually enables or enhances that bonding process… then I say it’s a good thing. It is Livestock Show and Rodeo time in Houston and that means it is "cowboy" time. Seeing all the hats, boots, big belt buckles and slightly too tight jeans (which can be a good or bad or bad thing depending on the wearer) got me thinking about the link between cowboy culture and whiskey and that is of course specifically rye whiskey. Many cowboy movies contain the iconic scene of cowboy walking through the saloon doors (often the music stops and the locals turn and stare at the stranger), striding up to bar with his spurs jangling and ordering a whiskey. The timid and nervous looking barman (always in a bowtie for some reason) pulls a cork out of a bottle, pours a shot and the hero throws it back, stamps his foot, pulls a face then orders another or says " ...leave the bottle". In many cases that same bottle is smashed over the head of Bad- Breath Pete (that's a good name for independent Islay bottling) later in the scene. In the cowboy-comedy-cartoon version the drinker's hat flies off, steam comes out of his ears and the barman then makes a comment about it being "the good stuff". You never see the cowboy comment to the barman about the nose and making some notes in his leather bound whiskey journal. The overall impression you are left with is that rye whiskey is stuff to get down as quick as possible and is about getting drunk and quite often leads to a gun fight. In the politically incorrect movies the local tribes were always keen to drink the white man's "fire water". That name is not exactly positive either and would have the marketing guys today reaching for their six guns (or at least their iPhones). Then I tried Sazerac Rye and that all changed. The standard Sazerac rye is good. It is cotton picking, rooting tooting good. I have also now tasted and reviewed the Sazerac 18 year old, Thomas H Handy and Pappy Van Winkle rye whiskies and find they are also as complex, rich and rewarding as any single malt. I can't recommend them enough (other than the fact they are hard to find and not cheap) and as yet since I started drinking ryes I have not been involved in single gun fight and considering I live in Houston, Texas that is not something you can actually rule out. So my advice is if you also have the image of rye whisky as the cowboy whiskey, you need to go to your local store or favorite online retailer and order a bottle of Sazerac. You can thank me later pardner or to paraphrase John Wayne... "Get off your horse and drink your whiskey".